In the Harvard Club of India hosted conversation between Mr. Karan Thapar and Justice Chelameswar on 7th April 2018, Journalist Thapar had posed a question to Justice Chelameswar, regarding the propriety of the 12/1 Press Meet. The question drew its relevance from the 9th principle of the “Restatement of Values of Judicial Life” 1997 that was adopted by the Supreme Court in its Full Court as a charter to be followed by judges, which stated “A Judge is expected to let his judgments speak for themselves. He shall not give interviews to the media.” The 9th Principle speaks for itself, and does not require any further interpretation. The bar on interviews to media is only with respect to the judgments authored by the judges and not with respect to their administrative functions. So was the crisp answer given by the Justice Chelameswar who also remarked that the principles governing Judges’ conduct that had evolved in other countries, where judiciary plays a mere adjudicatory function cannot be forced on our judiciary which handles administrative functions like selection of judges. The Supreme Court of India is not merely an adjudicatory body. It exercises two very crucial administrative functions, (i) Selection of persons to be appointed as Judges to the Supreme Court and High Courts and (ii) Allocation of cases to specific Benches constituted for that purpose. The first of these is exercised by the collegium comprising of the CJI and four senior most judges of the Supreme Court. That would mean that it is 4 out of 5 in the collegium that declared to the nation its dissatisfaction over the state of administrative affairs within the judiciary. The most decisive administrative function of the CJI is that of assigning cases to specific benches and the constitution of the benches for this purpose by virtue of Order VI of Supreme Court Rules 2013 made under Art.145. This power is exercised solely by the CJI, unguided and unbridled. Though the Constitution and the Supreme Court Rules are silent on the procedural propriety and individual integrity that the CJI should abide by in assigning cases and constituting benches, he/she is definitely bound by constitutional accountability and his own oath of office. It is against the manner of exercise of this power by the CJI that Justices Chelameswar, Ranjan Gogoi, Madan Lokur and Kurian Joseph, the second to fifth in line of seniority, blew the mighty whistle on 12/1. Democracy in India is a constitutional construction; India never had any taste of democracy ever before the Constitution of India. Yet it caught up powerfully; people’s movement and public gaze is a compelling and probably the last check on governmental institutions. It is this democratic rheostat that the four judges of the Supreme Court resorted to switch on, by meeting the media on January 12. This evoked hue and cry on grounds of judicial ethics and propriety, all founded on utter disbelief as to how could the judges ever have spoken about the discrepancies within the judiciary. The contest was never on the factual correctness of the content of the letter that was made public on 12/1; ironically it was all about the correctness and the ethics in making it public. And immediately thereafter the judges were put on trial by media, by members of legal fraternity and by the establishment itself. Their propriety, ethics and conduct all were put to test. Judges worldwide are required by the basic principles of judicial conduct to lead an aloof life, without mixing with the general populace and with limited social life. Judges never brought up any contentious issues, never rebelled and never responded to issues in public. The press meet therefore was no doubt unprecedented, but does that mean it was improper? Judiciary, oddly, is one institution in our country where neither transparency prevails nor accountability subsists. Our judicial administration has inherited along with the Lordship title, the colonial traits of secrecy too. The Supreme Court which polices the corridors of power does not seem to have any policing in its own shady corridors. The Constitution prescribes only one ultimate step against judges of the constitutional courts, namely impeachment on grounds of proved misbehavior or incapacity [Art.124(4)]. This would be like how Justice Krishna Iyer observed in his book, ‘Justice At Cross Roads’(1992), there is only one punishment namely capital punishment for all offences be it theft or murder. As of now, institutional accountability is ensured solely by placing reliance on the good sense and wisdom of the judges alone. It is in these circumstances that the propriety of the press meet need to be evaluated. Independence of judiciary is primarily the independence of the persons manning the institution. In a system which lacks transparency, accountability and external checks, the independence and integrity of judiciary requires to be insisted by persons from within the judicial institution itself. The responsibility of members of the collegium is exceptionally high in this regard. Any shadow of impropriety in constitution of benches and assigning of cases to specific benches, reasonably elicit responsible responses from other judges and more importantly from the members of the collegium. When the four collegium members noticed that diligence was not maintained in assigning cases and in constitution of benches, corrective mechanism from within becomes the only way possible. The judges did not on one fine morning, wrote a letter and gave it to the press. They had addressed the issue within the institution and had written to the CJI in November 2017. In the event of a no-response from the CJI and continuing lapses being noticed, the judges decided to meet the media and inform the nation. In doing so, in fact the judges had subjected themselves to the risk of public scrutiny as well, knowing fully well the existence of embedded media and the pre-designed pro establishment campaign groups. The highest commitment that a judge has is to his oath of office, to uphold the Constitution and to perform the duties of his office without fear or favour, affection or ill will, to the best of his ability, knowledge and judgment. It is on these lines that the nation should scrutinize the conduct of these judges. The precise question to be asked is whether the press meet amounted to upholding the Constitution or not. But then many more related questions assume relevance. What are the options available to the judges to uphold their oath when they notice a system error or abuse of power from inside? Are not the judges to act as whistle blowers when they in their best knowledge and judgment detect conspicuous deviations from the constitutional path of power? How long can judicial augustness cover up the dignity of the institution, when dignity itself is being hampered with? Is not calling a spade a spade, more credible that covering it up under the guise of ‘judiciary can do no wrong’? The power of insider speaking out is huge in a democracy. When the sole objective is correcting the system, reporting to the people of the nation was indeed the only constitutional way out, when internal corrective efforts turned futile. What is essentially wrong if the people come to know the lapses in the system? Indian democracy is not that immature as to collapse with a nervous breakdown at the drop of a judicial wig. And mind you Loyalists, none was surprised. What was whispered in hallways was spoken loudly and clearly. The whispers were always there, it takes someone somewhere to take a step, and the country was fortunate to see four strides at a go. It is illogical and incomprehensible as to why should there be a fear when lapses in the judiciary are pointed out and who in the judiciary should after all fear public scrutiny. Is it not the loyalists’ deep rooted psyche of colonial submissiveness that has made them more loyal to ‘My Lord’ than the Constitution itself? Following the Judges’ press meet, the whole issue unfortunately turned out to be one of establishment versus anti-establishment campaign. It makes one wonder - Is insisting on judicial independence anti-establishment? Or is judicial esteem guarded by secrecy, the establishment? Where then does the Constitution of India stand? When the Government and its aligned media perceives the judges’ disclosure as a threat on the establishment itself, that is reason enough for grave concern, as much as government interference in judicial administration is. The very basis of the aloofness demanded of the judges is the impartiality that is expected of the judiciary. In that case, from who are the judges meant to be aloof – only from the common people or also from the government towards which the judges shall hold no fear or favour? It is ridiculous to portray the judges’ press meet as a threat to independence of judiciary and keep silence about the many meetings of the Judges and Ministers in public and the bonhomie that they share blatantly. Judicial independence in this country still means freedom of judges from fear or favour of executive will. And such seemingly unholy alliances pose a greater threat to democracy and to the Constitution itself than four senior judges holding a press conference. It all looks to the common man that the government is playing a Game of Thorns, by drawing a line with roses on one side and thorns on the other. The judges are left to choose the sides. Almost three months have lapsed since the collegium recommended the name of Justice K.M.Joseph for being elevated to the Supreme Court and yet government is sitting over it. No reason (forget cogent) is given as to why the recommendation is not executed. Unsurprisingly the CJI has not pursued the matter as well. When government unashamedly disregards the recommendations made by the collegium and the CJI gracefully abstains from pursuing the recommendations, it is obvious who is on the side of thorns and who is not. CJI appears strong and weak, depending on which quarter you stand, executive or judicial. And in the process, the guard of institutional integrity gets lowered too, by default. Strangely, the otherwise vibrant conscience keepers of judicial honor among the Bar, are keeping themselves anchored in their risk free comfort zones too. And other judges in the collegium are taking unparalleled and bold steps to correct the system and save the Constitution. Justice Chelameswar had written to the CJI to have a full court discussion on the matter of government interference in High Court Judges’ appointments, and Justice Kurian Joseph had followed suit. It is time we realize that Constitution itself is under threat when judicial independence is compromised and is the single biggest security threat to the country as pointed out by Prof. Mohan Gopal. The more contentious constitutional values like secularism which had always been disputed, pose a greater risk of being defaced. It is conspicuous that on matters as grave as this, no alarm has been raised by any of the mainstream media in our country and no questions of impropriety have been posed. That leads to a genuine doubt on the independence of the media as well, which is equally crucial for the sustenance of a sound democracy. 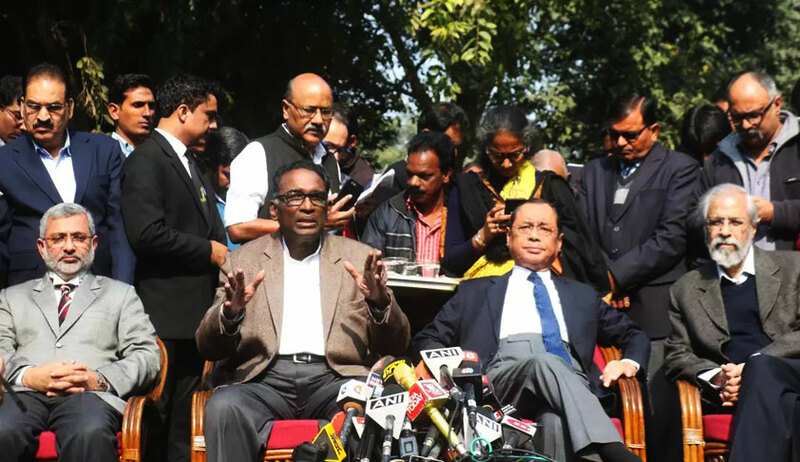 The media in putting the four Judges on Trial had indeed shown commitment to its profession, but the same media in forgetting to do so in respect of the concerns expressed in the 12/1 letter and the later letters of Justices Chelameswar and Kurian Joseph, is showing its ardent commitment to the government, undoubtedly and manifestly.